I really wish this had been around for Halloween but Coffee With Zoe recently created this tag after being inspired by the Walking Dead. Naturally, the idea isn’t to create an actual look for the apocalypse or to create the illusion that we’d honestly care that much about our appearance when running for our lives. Instead, it’s about trying to think about what you truly value among all your products. This is not a survival kit, but it’s what I’m bringing with me to Wellington. For some reason I’ve already packed 95% of what I intend to bring. I thought this was a good start because it’s already a case of finding what you really need for a few days. 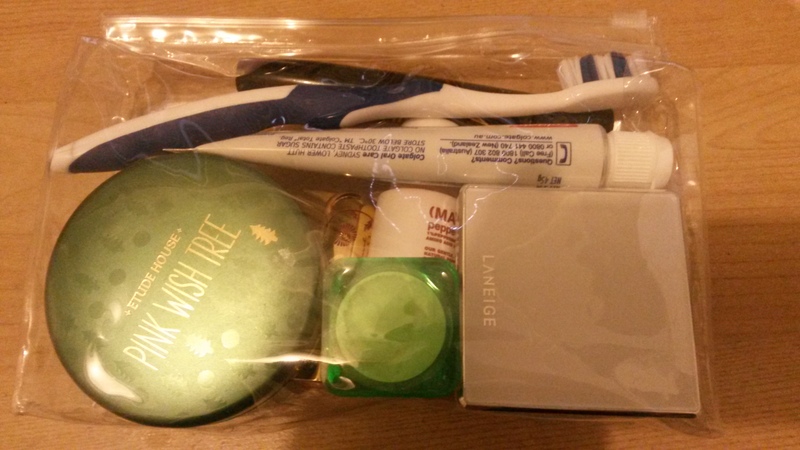 I would include a simple toothpaste and tooth brush in my essentials, or my zombie kit if we should stick to the theme. See, if the world was falling apart, the last thing I’d want to end up with would be teeth issues with no access to dentists. Plus, you’re already going to stink, so we can at least try to avoid bad breath. The next thing is a set of shampoo, conditioner, and body wash. Sure, you may have to use any relatively clean water you can find. But decent hygiene would play an important role in avoiding falling sick, keeping wounds clean, and being able to get all of that infectious zombie blood off of you. I think I’ve also got a cleansing powder and a moisturiser in there. Because of its dual functionality, we’re including my trusted Etude House cushion compact. Sure, it’s a foundation but it’s also SPF 50. I’d consider SPF pretty important if I was going to be outside way more than I am now. There’s three luxury items in this kit. A small palette with four eyeshadows, a mascara, and a red lipstick. I doubt I’d ever get to use this if there was an actual apocalypse, but the same thing can be said for anything else since I’d probably die fairly early on. The lipstick I chose is Bèsame’s Red Velvet because it’s good and the packaging is lighter than my Guerlain one, which I’d care about if I had to carry this kit with me at all times. That’s also why I went with a cleansing powder rather than a liquid cleanser. The mascara is the Clio one I won’t shut up about because I figure it has the greatest chance of surviving the apocalypse. The eyeshadows are from Laneige and I picked them because it’s a small but practical palette that comes with brushes and a mirror. The two things I’d include that aren’t in this package? Deodorant and Papaw Ointment.